Sambhar/ sambar is one of common everyday dish in all parts of southern India, with its own regional variations. Sambhar is also cooked for festivities. Sambhar also varies from one house to house by either change in the way it is prepared, or differences in ingredients used in the spice powder. While growing up, I was not a fan of sambhar, poor mom had to go through all the tantrums of I won’t eat this, I will eat this. I don’t know how she addressed everything in a calmly manner and satisfied everybody. My mom made sambhar with either vegetable medley or some time with only pearl onions; if pearl onions were used in sambhar then I was happy to taste some. In Kerala sambhar is made in two ways, in the southern parts they don’t any coconut, whereas in the Palaghat area, they add coconut to sambhar. The first time I tasted Palghat sambhar was from a hostel cafeteria; where I was staying while teaching at a Government college in Chittur, Palaghat. They used to make sambhar with onions and okra at that time. However amma didn’t add any okra in sambhar as it makes gooey mess. 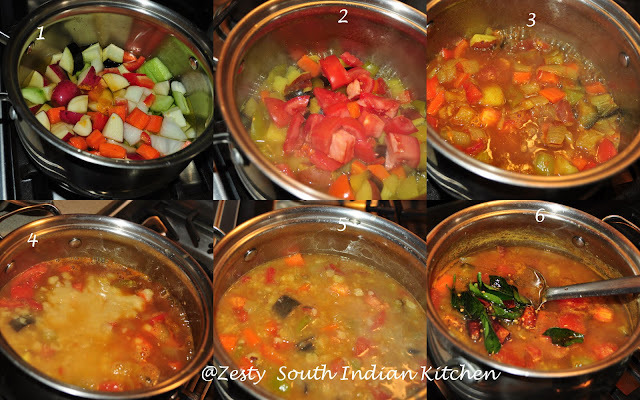 When my mom made the sambhar she would pressure cook the lentils, and cook the vegetables separately. She usually added cucumber, eggplant, onion, taro root, drumstick, carrot etc. In addition to the vegetables used by my mother I will also add bell pepper. Sambhar is very forgiving dish and you can’t mess it up, unless you add a really bad spice powder. In my house sambhar is the weekend special. If you have some stir fry to go with them then it is wonderful. In my aunt’s house (dad’s brother’s wife) they make sambhar and cabbage stir fry every day. Sambhar has an interesting history. It is thought to have originated in the kitchen of a Tanjore ruler named Sambhoji. Sambhoji was from Maharashtra, and was also supposed to be a good cook too. He liked to eat amti (Maharashtrian lentil gravy) everyday. The souring agent added to amti was kokum, which was imported from his home land. One fine day no kokum was available, due to delay in getting it from Maharashtra. His cooking assistant, a jokester, told sambhoji that since kokum was not available, we could probably use tamarind pulp as a substitute, because locals were using it in their curries. Sambhoji took his assistants advice and cooked dal and vegetables with tamarind and spices, and thus sambhar was born. Read more from here. After the introduction of red chili to India (around 400 years ago), it was also integrated into the Sambhar spice mix. The spice used in the sambhar which is called sambhar powder varies according to the region it is made. The main ingredients are toor dal, chana dal, red chilies, coriander powder, fenugreek seeds, and asafetodia. Further add-ons depending upon the region are cumin seeds, urad dal, curry leaves, cinnamon, black pepper, mustard seeds, cloves etc. I didn’t get time to make homemade sambhar powder, so after testing several brands; I am settled with two brands now. I used egg plants, red bell pepper, green bell pepper, potato, onion, tomato, cucumber, carrot along with ½ cup of toor dal and tamarind. Seasoned with mustard seeds, red chilies curry leaves, coriander leaves and asafetodia; try it you are also going to love with gem from the south Indian cuisine. Here is my version of sambhar . Water: 21/2cup for cooking dal+ 2 cup for cooking vegetables + ¼ cup for extracting tamarind juice. Wash and pressure cook the toor dal until 3 whistles or about 20 minutes. In medium sauce pot add all vegetables except tomato and turmeric powder, ½ teaspoon salt and 2 cup of water and cook until everything cooked well about 16 minutes. Around 14 minutes add chopped tomatoes and cook for another 2 minutes. In a small bowl add tamarind and ¼ cup water and extract the tamarind juice and set aside. To cooked vegetables add tamarind juice and bring to boil once starts boiling add sambhar powder and let it boil for another 2 minutes. To this then add cooked mashed dal and bring it to boil once again for about 2 minutes. Switch off the flame and set aside. In a small pan add oil and mustard seeds, red chilies, curry leaves and asafetodia and once mustard seeds start spluttering switch off the flame and add to cooked sambhar. Enjoy with rice and stir fry. Those who interested in trying the homemade sambhar powder here is recipe. Dry roast each spices individually and set aside. When it is cool enough to touch grind it into fine powder and let it cool once again for another 30 minutes. Store the cooled sambhar powder in an airtight container. Use it as needed. Fav dish n ur cliks r awesome..n lovely one..
What a great stew! I love all the veggies in there and it sounds perfect with those spices! Ente daivame, njan dha lunch kazhikan pokayrunu, ny fav fav, adipoli tto swathi.. I always make it with readymade sambhar masala packets.. but sure will try your fresh masala way..
With all those veggies and spices ! Adipoli sambar, Swathi..Kurachu chorrum thoranum koode undenkil kushal!! Nalla tempting pics..
It’s interesting to know the history behind the Sambhar..Thanks for sharing it. I love the recipe for home made sambhar powder.. It makes real difference to use the fresh ingredients… gorgeous pics!!! This looks really delicious. I love the history of the dish as well. Sambhar is such a comfort food. Nice recipe. Which are the two brands you like, btw? 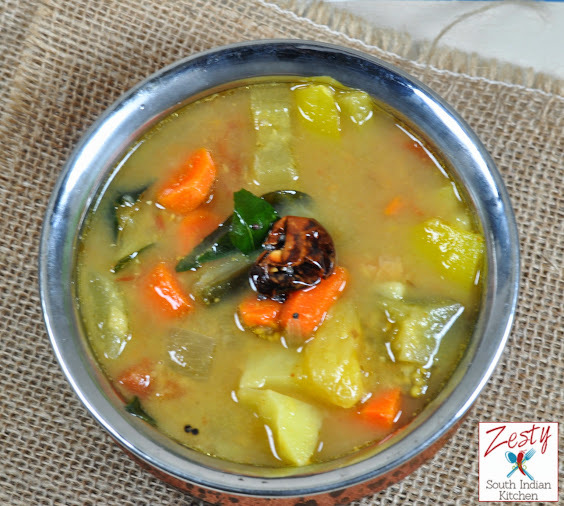 Sambar with many vegetables is a royal treat. Never knew the story behind and glad to know its origin:) Love sambar in any preparation. Your sambar makes me drool:) The powder recipe is very nice dear. If you can get Sakthi sambar masala powder, try it once….and you will love it. I will make my own sambar powder as well as buy this, as I can’t do without sambar:) I am gonna try your method tomorrow! Happy weekend Swathi! Sambar is my all time favorite. Looks good. Looks so tasty, thanks for sharing the story behind this dish ……. Wow, even if your step by step makes it look so easy it is going to be years before I can make Indian food properly! But I am getting (slowly) more confident! What a beautiful dish Swathi! I love the explanation of how this dish was born too! Swathi love this dish. Back to blogging after a long break and in a new space. Hope you are doing good. I love sambhar especially with coconut, it’s creamier tasting! In the Spring when drumsticks are sold at the farmer’s market, I will add them to the recipe too. Your version is just perfectly spiced and delicious! I’ll try it for sure! Your cooking is the best and so detailed to perfection. It gives your readers so much confidence to follow the recipes! Looks good! I made sambal too but a different kind. I have been craving soups and stews like this non-stop! Delicious. Sambhar is my all time favorite and that looks delicious. What a delicious curry. I’ll sure give this a try. How hearty and delicious! I like hearing about how it came about and I am a sucker for tamarind! I love it. Swathi-Such a delicious hearty, and comforting Sambhar…now, can you please pass a bowl of it to me?